The Shanghai Public Space Art Season (SUSAS) is a new city-wide biennial event initiated by the Shanghai Municipal Bureau of Planning and Land Resources in cooperation with the Shanghai Municipal Administration of Culture, Radio, Film and TV. Its mandate to improve the quality of public spaces in Shanghai and its program includes exhibitions, lectures, forums, public art commissions as well as other showings of urban design associated practices. The inaugural SUSAS is on September 29 through December 2015, under the theme of “Urban Regeneration.” Aside from pre-event forums, one main exhibition pavilion will be held in the West Bund Art Center to show cases architectural project, urban design case studies, and art installations from both local and international, along with fifteen off-sites projects across the city to introduce recent achievements of urban regeneration in Shanghai. On the occasion of 2015 SUSAS grand opening, a series of forums and panel discussions are held from September 28th through October 1st. Both local and international speakers from the fields of architecture, urban planning, and art will take up the platform of SUSAS and share their insights. 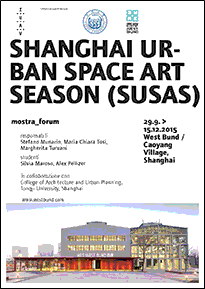 The Organizing Committee at 2015 Shanghai Urban Space Art Season (SUSAS), invited the College of Architecture and Urban planning and Università Iuav di Venezia to have a participation in 2015 SUSAS main exhibition pavilion. CAUP and Iuav participate by showcasing the result of a JOINT STUDIO on Urban Public Space in Shanghai, CAO YANG NEW VIllage. The joint Studio run in the period September to December 2014, in Shanghai and in Venice. A team work, involving Iuav and Tongji professors and Iuav and Tongji students during the summer 2015 realized the production that is now showcased at West Bund Biennale Shanghai. Università Iuav di Venezia is also participating in collateral exhibit together with CAUP TONGJI, in Caoyang New Village, to be held in October 2015. The concept of state-supported housing was introduced in 1951 with the development of Caoyang Xin Cun (Caoyang New Village) in an existing industrial zone on Shanghai’s western periphery. Following the construction of the Caoyang Xin Cun, many other residential complexes were built. Caoyang New Village is the first Worker’s Housing Project in Shanghai established by the government in the 1950s. It’s also the earliest working village in China. The village, occupying a total area of 180 hectares and with a construction area of 1.678 million square meters, is a major residential area, which has a population of more than 100,000, located in west Shanghai.